The first country vocalist to win American Idol, Carrie Underwood grew up in the small town of Checotah, OK, and started singing with her church at the tender age of three. Throughout her childhood, she also performed at functions for the Lion’s Club and Old Settlers Day, eventually grading to festival gigs in several states. Along with developing her singing, Underwood learned to play guitar and piano. She graduated from high school as her class salutatorian and majored in mass communication at Northeastern State College with an eye on a career in broadcast journalism, but continued her singing career throughout her studies. As a senior just a few credits short of her degree, Underwood heard about the auditions for the 2005 season of American Idol. She attempted out for the show at the St. Louis, MO, auditions, and her innocent charm and pure, pretty voice ended up winning her not only a place among the 12 finalists, but the title of 2005’s American Idol. Her debut single, Inside Your Heaven, was released that summer, and she started recording her debut record after completing the American Idols Live! tour. Some Hearts was put forth later that fall and became a smash hit, selling over 300,000 copies in its first week and eventually going platinum a whopping seven times. The album’s lead single, “Jesus, Take the Wheel,” was also a big success, topping Billboard’s Hot Country material chart for six weeks. Acclaim for the record and single spilled over into 2006, when Some Hearts re-entered Billboard’s Top Ten after Underwood’s appearance on the 2006 American Idol finale. Meanwhile, “Jesus, Take the Wheel” won Single album of the Year at the Academy of Country music Awards (where she also won Top Female vocalist); a Dove Award from the Gospel music Association; and Breakthrough Video and Best Female Video at the CMT Awards, making her the only double winner at the event. Despite her hectic career as a country music star — which included carrying her Some Hearts tour through the fall of 2006 — Underwood found the time to finish her degree and become a spokesperson for People for the Ethical Treatment of Animals (who named her 2005’s World’s Sexiest Vegetarian). “Before He Cheats” was released as Underwood’s third single late in 2006, and became her third country number one and her fourth total number one hit. That December, she won five Billboard music Awards: record of the Year, Top 200 Female Artist of the Year, Female Country Artist, New Country Artist, and Country record of the Year. Early in 2007, Underwood began work on her second album, during “Wasted” became the fourth single taken from Some Hearts; she performed it on an episode of American Idol that March, and the not long after month, it hit number one on the Hot Country music Chart. Underwood gathered more accolades by winning three awards at the 2007 CMT Awards — Video of the Year, Female Video of the Year, and Video Director of the Year for “Before He Cheats” — and taking home two Grammys. She also took home three 2007 ACM Awards in May, which included record of the Year for Some Hearts and Top Female singer. She made another trip to American Idol late in the month for the sixth season finale, where she sang “I’ll Stand by You” to a standing ovation. while the show, Clive Davis recognized Underwood’s sextuple-platinum sales; Underwood was the first country artist to sell that many copies of a debut album since LeAnn Rimes’ Blue in 1996. She also appeared on Brad Paisley’s album 5th Gear, which was released in June 2006. CMT IS SPOTLIGHTING MULTIPLE GENRES AND GENERATIONS AT “2018 CMT ARTISTS OF THE YEAR” WITH SEVEN NEW PERFORMANCES. HONOREES CARRIE UNDERWOOD, MIRANDA LAMBERT, KELSEA BALLERINI, MAREN MORRIS, LITTLE BIG TOWN’S KAREN FAIRCHILD AND KIMBERLY SCHLAPMAN AND LADY ANTEBELLUM’S HILLARY SCOTT ARE SET TO PERFORM AT THE OCTOBER 17TH CELEBRATION WHICH WILL AIR ON CMT AT 8 O’CLOCK EASTERN TIME. Cry Pretty Listening Party on Country Music News Blog! CAPITOL NASHVILLE’s CARRIE UNDERWOOD will be honored with the Hero Award at the upcoming RADIO DISNEY MUSIC AWARDS being held FRIDAY, JUNE 22nd at the DOLBY THEATRE at HOLLYWOOD & HIGHLAND CENTER in HOLLYWOOD. A special telecast of the sixth annual show, “2018 RADIO DISNEY MUSIC AWARDS,” will air on SATURDAY, JUNE 23rd at 8p (ET/PT) on DISNEY CHANNEL as well as multiple DISNEY-branded platforms. UNDERWOOD will be recognized for her generosity, humanitarian efforts, and dedication to supporting a myriad of charities. Additionally, UNDERWOOD is scheduled to perform “The Champion” with LUDACRIS. Carrie Underwood is BACK and better than ever with her release of the official video for the tearjerker anthem “Cry Pretty“. You can catch Carrie Underwood returning to American Idol and a superstar guest mentor on May 13th. Underwood will also perform her hit single, “Cry Pretty,” which Underwood co-wrote and co-produced, and debuted in its first week sales at #1 in the U.S. all-genres, topping the iTunes Top Songs charts in 12 countries. The new album – her first for Capitol Records Nashville – will be released on September 14, marking the first time she has co-produced her own album. 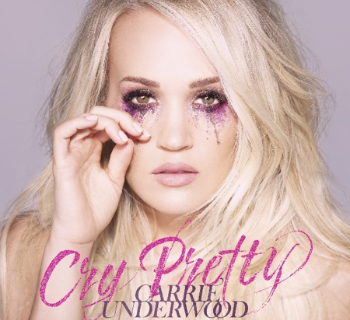 Lead Single and Title Track is No.1 Most Added Single at Country Radio and Has Already Topped iTunes Top Songs Charts in 12 Countries Multi-platinum global superstar Carrie Underwood will release Cry Pretty, her first studio album on Capitol Records Nashville on September 14. The title track and lead single was released worldwide on April 11 and is the most added song at Country radio this week. “Cry Pretty” has already topped the iTunes Top Songs charts in 12 countries and quickly racked up over 1.3 million streams in the U.S. with only two days of reporting. In addition to co-writing the single with Hillary Lindsey, Lori McKenna, and Liz Rose (aka The Love Junkies), Carrie is co-producing her album with fellow writer/producer David Garcia. Underwood says, “At this point in my career, I feel stronger and more creative than ever. I think you can hear that in this new album. It’s emotional, it’s soulful, it’s real, and we also have some fun on there too. I hope everyone loves it as much as I have loved making it.” On Sunday night at the 53rd Annual Academy of Country Music Awards™, Underwood took home her 14th career ACM Award for Vocal Event of the Year for “The Fighter,” her collaboration with Keith Urban, after bringing the audience to their feet with her emotional performance of “Cry Pretty.” Billboard ranked the “vocal dynamo” performance as the best of the night, touting “this is how you do an award show performance” while Rolling Stone noted that Underwood “channeled her inner country-soul diva” during the “knockout rendition.” Underwood, who is a seven-time Grammy Award winner, gives fans an intimate look inside her recording and co-producing process for Cry Pretty in this exclusive album trailer.